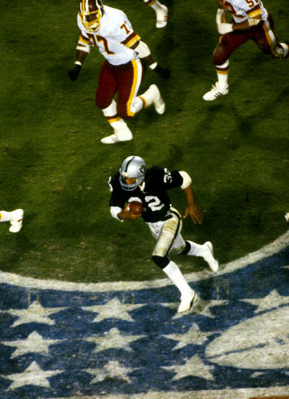 The Moment: With just over 10 minutes left in the game, QB Joe Theismann handed the ball to 240 pound FB John “The Diesel” Riggins, who broke a tackle from Miami cornerback Don McNeal and managed to somehow build up enough speed to outrun defensive back Don Blackmon as he rumbled for a 43-yard touchdown run, giving Washington their first lead of the game, 20–17. Riggins was so slow that the play took nearly five minutes off the clock. 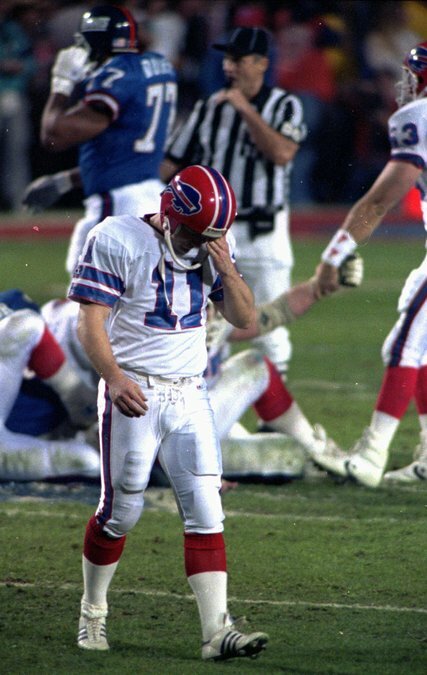 The Moment: Bill’s kicker Scott Norwood (Number 11) squanders Buffalo’s best chance to win a Superbowl when his potentially game winning kick missed wide right and he stood dejectedly with his head bowed in lonely defeat. The Moment: Late in the game, with the Bills clearly beaten, Cowboys defensive lineman Leon Lett scooped up a Buffalo fumble and, with no one in front of him, appeared to be headed for a 64-yard touchdown return. 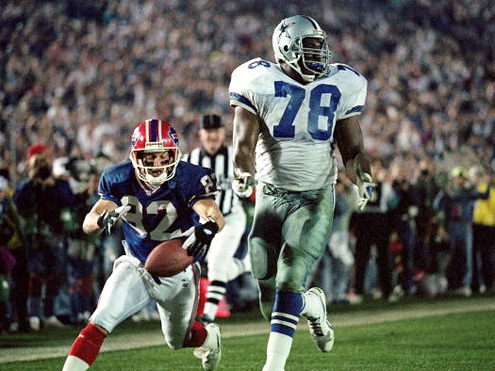 Just before crossing the goal line, determined WR Don Beebe raced in from behind and knocked the ball out of Lett’s arm and into the end zone. The ball then rolled out of bounds for a touchback. The play is considered to be the best “hustle” play of all time. The Mom ent: On last play of the third quarter, Raiders RB Marcus Allen took a handoff and started to run left as the play was designed. But after taking an unusually wide turn in that direction, Allen was cut offby several defenders. He abruptly stopped, circled beautifully around back to the middle of the field, and sliced through the Redskin defense for a 74-yard touchdown run. This stands as the most gorgeous run in Superbowl history. 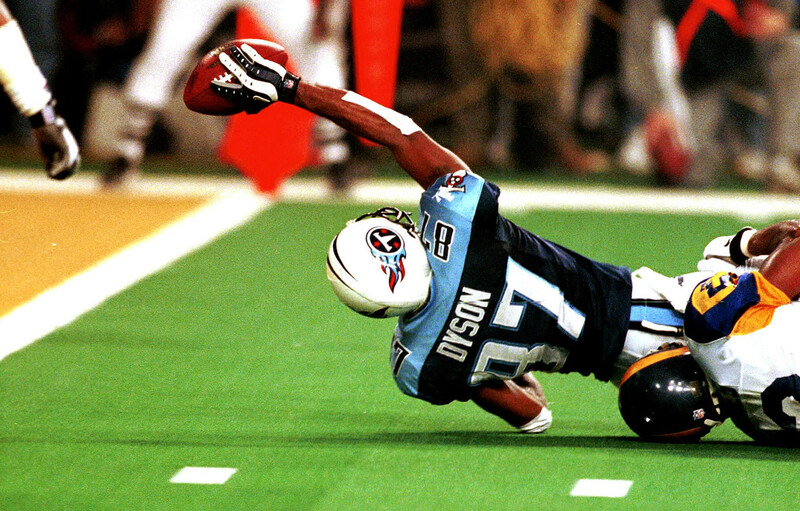 The Moment: With the game on the line and one play left, Titans QB Steve McNair passed to wide receiver Kevin Dyson, who snagged the ball at the three yard line. Unfortunately, Dyson was tackled by a shoe string and rolled to the ground just one, gut wrenching, yard short of a game tying touchdown.. 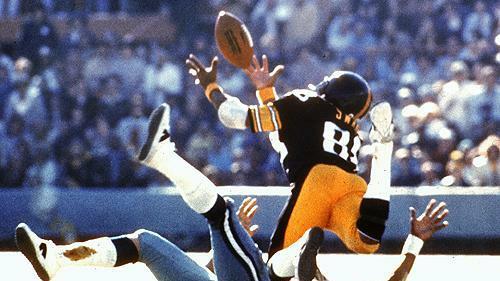 The Moment: No Superbowl catch has ever been more beautiful than the 53 yard reception made by Steeler’s WR Lynn Swann in Superbowl 10. 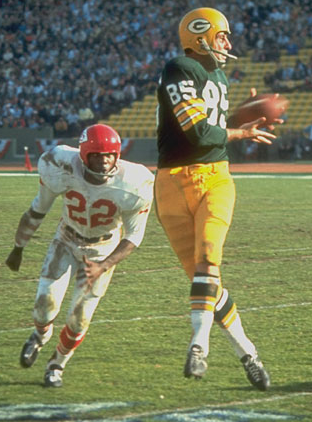 Swann, who notoriously perfected his craft by taking ballet lessons in the off season, looked like poetry in motion. Put the play to classical music, watch it in slow motion, and see Natalie Portman swell with envy. The Moment: Seattle RB Marshawn Lynch had made a reputation of dominating teams with his “Beast Mode” performances in the fourth quarter of previous games. This Superbowl was no different. Beast Mode was again dominating during Seattle’s final drive. Yet, with the ball on the one yard line late in the game, the Seahawks inexplicably called a quick slant pass play to WR Jermaine Kearse. 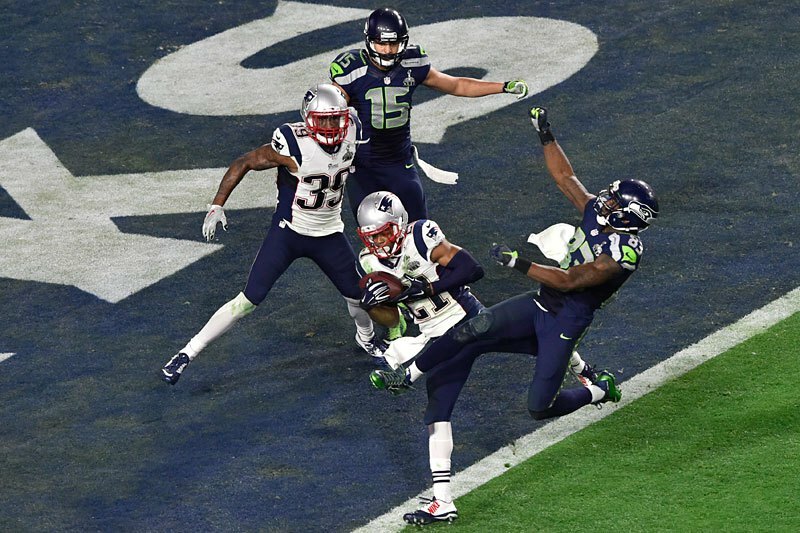 Patriots CB Malcom Butler correctly read the play, rushed into position to make the interception, and effectively ended the game. 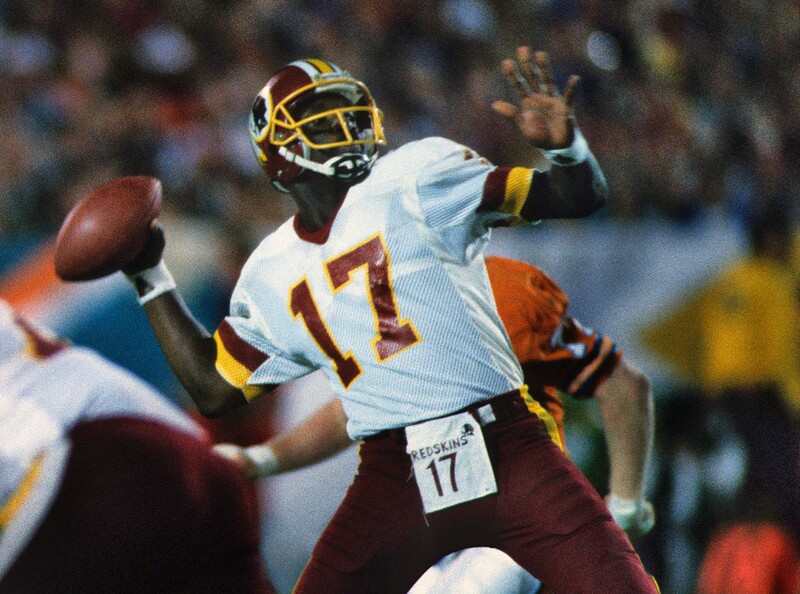 The Moment: Redskin QB Doug Williams was the first African-American quarterback ever to start in a NFL league championship game, let alone a Super Bowl. Prevailing racist thought at the time was that a black QB lacked the intelligence to lead an NFL championship football team. With Denver leading 10–0 at the end of the first quarter and Williams hobbled by an injury, that mentality remained unchallenged. 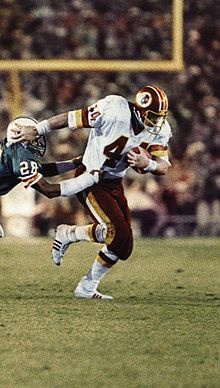 However, in the second quarter alone, Doug Williams had incredibly completed 9 of 11 passes for 228 yards and 4 touchdowns, forever destroying the myth of the weak black quarterback. 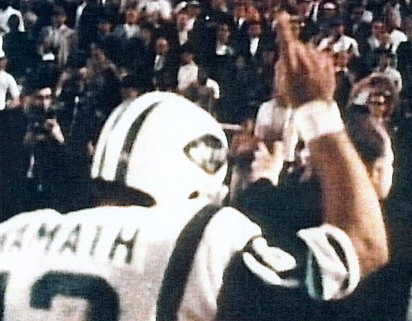 The Moment: Joe Namath going off the field while flashing a big number #1 finger with his right hand after he guaranteed his under dog AFL Jets would beat the heavily favored NFL Colts. Needless to say, Joe backed up his promise and his #1 ring finger felt like a middle finger to the old gaurd NFL. The Moment: New York’s QB Eli Manning ruined the Patriots’ bid for perfection with an otherworldly completion to little known receiver David Tyree, who miraculously managed to go down with the ball precariously pinned between his helment and fingertips. The Giants kept the drive alive, later scored a touchdown, and won the game. 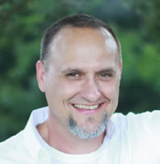 This entry was posted in NFL Football and tagged Top 10 Superbowl Football Moments. Bookmark the permalink.